These days fanbases are everything, be it the screaming hordes of teenage girls stalking boybands, or a niche but equally dedicated local band’s followers. 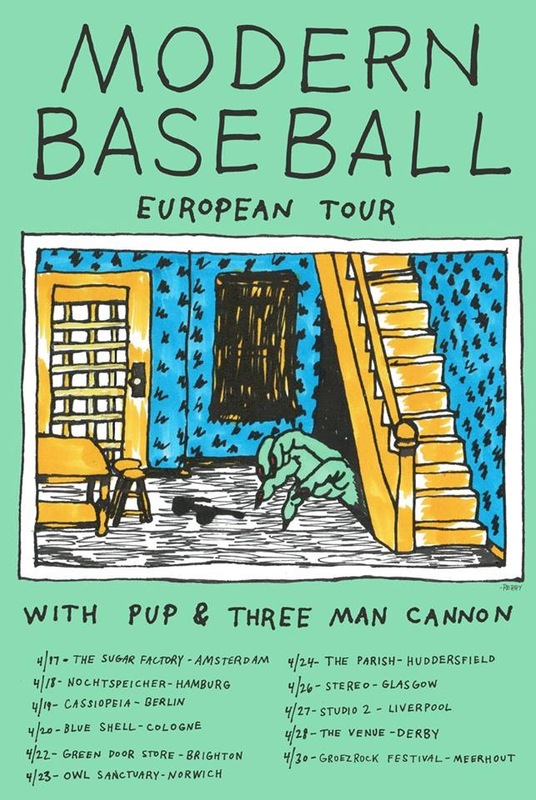 Philadelphia’s Modern Baseball have definitely earned themselves one of the latter in becoming a musical hidden gem. Their dates in the UK recently have mostly sold out, and are just another rung up the ladder for the quartet. Opening tonight are Three Man Cannon , and the most noticeable thing is the contrast between the stage presence of each member. Quiet, motionless, hyperactive and simply happy to be there are probably the best way to describe each of them respectively. As for the music, songs like Honest build beautifully and are perfectly pleasant, but don’t make too much of an impact. However, second support PUP  significantly up the ante. Their set is faster and rowdier than Three Man Cannon’s, and the likes of Guilt Trip and If This Tour Doesn’t Kill You, I Will make it a hell of a lot more fun. There’s a small but extremely passionate group in the middle of the room screaming every word back, and singer Stefan Babcock manages to keep them wrapped around his little finger while enticing the rest of the curious crowd with his hilarious pre-song stories and jokes about “Canadian moshpits” (a normal moshpit with a lot more apologising). There are a few lulls throughout, but it doesn’t stop this being an incredibly strong set that’s surpassed more than a few people’s expectations. The vibe throughout the hour or so the headliners are onstage is a strange one, as there’s next to no crowd movement throughout. But look around and the passion is obvious on every single person’s face as they shout lyrics back to the stage like it’s the last thing they’ll ever do. The whole thing, cheesy as it sounds, is like a huge group of friends coming together, and that in part is what makes Modern Baseball ‘s set so brilliant. The relatability of Tears Over Beers and Rock Bottom have more than struck a chord, and Studio 2 is filled with like-minded people creating something special, with the crowd doing so as much as Modern Baseball themselves. That’s not to say the band aren’t the focus, of course. They’re clearly having the time of their lives and are totally in their element, delivering near-perfect renditions of their album tracks and cracking jokes in between. They seem surprised at the subdued nature of the crowd (“you guys are really polite!”) and encourage more heckling (to which the crowd gladly obliges), but are taking it all in their stride. There are so many funny quirks here, with singer / guitarist Jake Ewald and bassist Ian Farmer frequently touching heads and dancing while playing, to singer / guitarist Brendan Lukens’ quips and huge grin plastered on his face serving as constant invitations for banter towards his bandmates. While it’s rare to see bands not enjoying themselves onstage, Modern Baseball have taken it to a whole new level by making tonight seem like a live show second and hanging out first. And both the fan vibe and the band’s excellence combined is what makes this a truly remarkable night. Despite last year’s The Perfect Cast EP not quite having as sizeable an impact as albums Sports and You’re Gonna Miss It All and Apple Cider, I Don’t Mind and Everyday from Holy Ghost having been dropped a matter of days ago, the crowd reaction is still huge. The set is mostly made up from You’re Gonna Miss It All tracks, and how good a call that was has been proved by the singalong to fan favourite Two Good Things (including the background “ba-ba-ba”s) clearly humbling Jake. But it’s closing duo Your Graduation and The Weekend where everything kicks off, with the entire crowd going from one extreme to the other flinging themselves around and rushing the barrier-less stage. It’s a huge reaction and Modern Baseball are well and truly thriving off it, with the grins they arrived onstage with having stretched even further upon leaving. While Modern Baseball’s execution of their set tonight has been technically outstanding, it’s been the atmosphere that has made this night so brilliant. In an era of bands spending thousands on production to earn top marks, it’s somewhat comforting to know that DIY bands can equal them using shedloads of personality and talent.